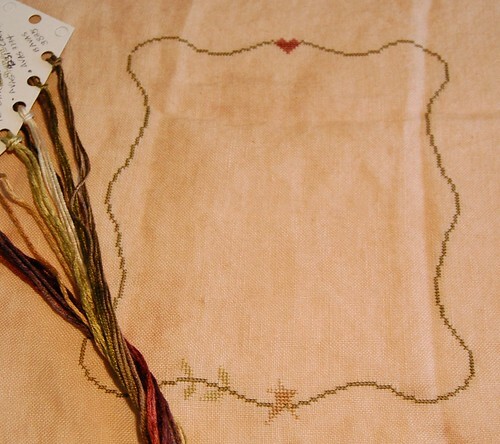 Nicole's Needlework: A Finish and Two Starts! I finished up "The Stockings" yesterday! I ended up taking out Santa's beard and using a brighter white and two strands so it would show up better. I had been saving HandWork's Frances Eden to start on New Year's Day, but I couldn't resist starting her early. 40 ct. Vintage Homepun, Vikki Clayton silks (1 over 2). 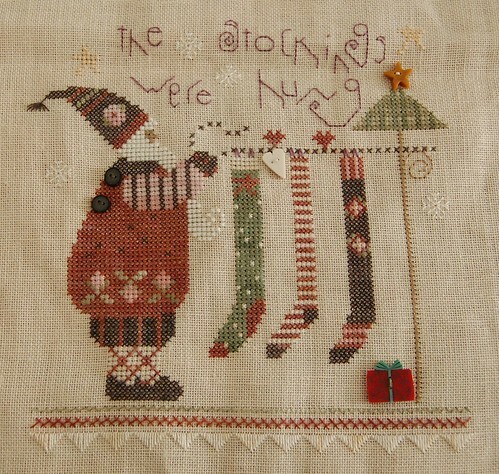 I also decided to start another Shepherd's Bush Christmas design - "Glad Tidings" kit. 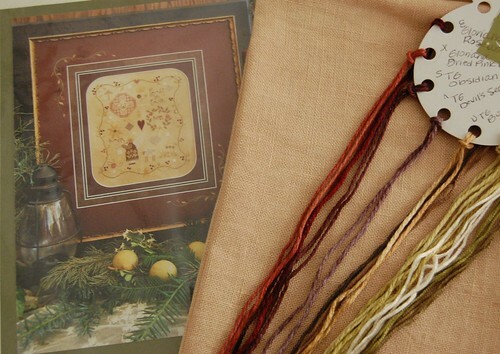 35 ct. Tea-dyed linen (replaced linen that came in the kit), various silk threads (1 over 2). Love your finish!! And your starts are fantastic! That is the cutest! I love your new starts also. Your finished Santa is beautiful. Lovely new starts did you choose. I can't wait to see your progress continue on Frances Eden. I've had my eye on that one for a while. You'll have it done in no time! Love your finishes and new choices! We must be pro-sisters at heart - I'm not finished with anything Christmas related. Everything looks great! I love SB! Every time I see you posted from Blog Press I'm so jealous! LOL. I hope to get an Ipad next year sometime. I know I asked you this before, but how do you get such great photographs? I am working on a Lizzie Kate piece with green fabric and the fabric in pics looks NOTHING like green. Any tips would be appreciated. Thanks. I just love your finish Nicole. And your new SB start too! And now, I see that you're starting Frances Eden and you're making me want to go back to mine! It's going to be fun watching your progress because you've started in the complete opposite corner. It will be fun to see what I'll be stitching in the future (that is, when I pick her up again!! Shepherd's Bush designs are just so adorable. Love how yours turned out. Beautiful finish Nicole! Great new starts too! Cute finish and I love your new starts!!!! Merry Christmas :-). Lovely finish. look forward to seeing more of your new starts. What a gorgeous New Year's start! I just love the stockings were hung! Is it a new SB kit? Beautiful finish! I love your new starts too. 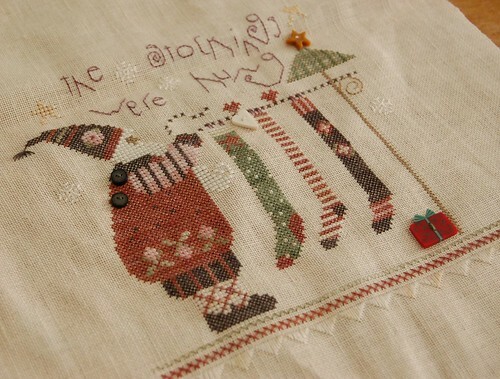 I really want to stitch Frances one day. Have fun with your relatives! Great finish! Love your new starts too! I love your finish and the change in Santa's beard, will make a mental note to do that for mine. Also love your new SB start. Frances Eden is going to be luscious, with those colors! Merry Christmas! I love Frances Eden (thinking of a restart, but I have so much going as it is) and I hadn't seen the new SB you started--it's very pretty. And the finished SB is adorable--my favorite is the little striped sock. I like a little last minute shopping as long as not ALL of it is last-minute. SB has the cutest designs. I really like your finish piece.I am looking forward to your Frances Eden progress. Wonderful finish on 'Stockings', Nicole! I love this design, it looks so festive with their fat Santa in it. Glad Tidings will be lovely too. What can I say, I'm mad for SB! Love seeing people stitching them up. Merry Christmas, if I don't get to you later on. What a sweet finish! I think that one's going on my wishlist, it'll be a nice companion to the new Merry Be design. Lovely new starts too, have a great Christmas. Your work is just breathtaking - A blog I truly love to follow !!!! Lovely finish! And very pretty new starts. Your finish is very pretty, congrats on starting two new projects. Merry Christmas. Congrats on your finish! Now you've got me wanting to start Frances Eden - dang it! Your finish is gorgeous, Nicole! Congratulations on the very timely finish, Nicole! I love your new starts. Frances is going to be gorgeous on that linen! Your SB finish is so cute! I love the design! I look forward to seeing progress on your Frances. I can't wait to start my NYD piece either and may do so this evening. Great finish! 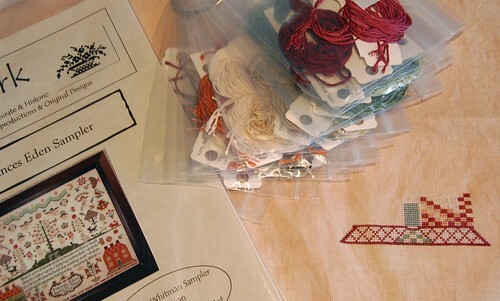 Hope to stitch that kit someday. I like your choice of new start, too.